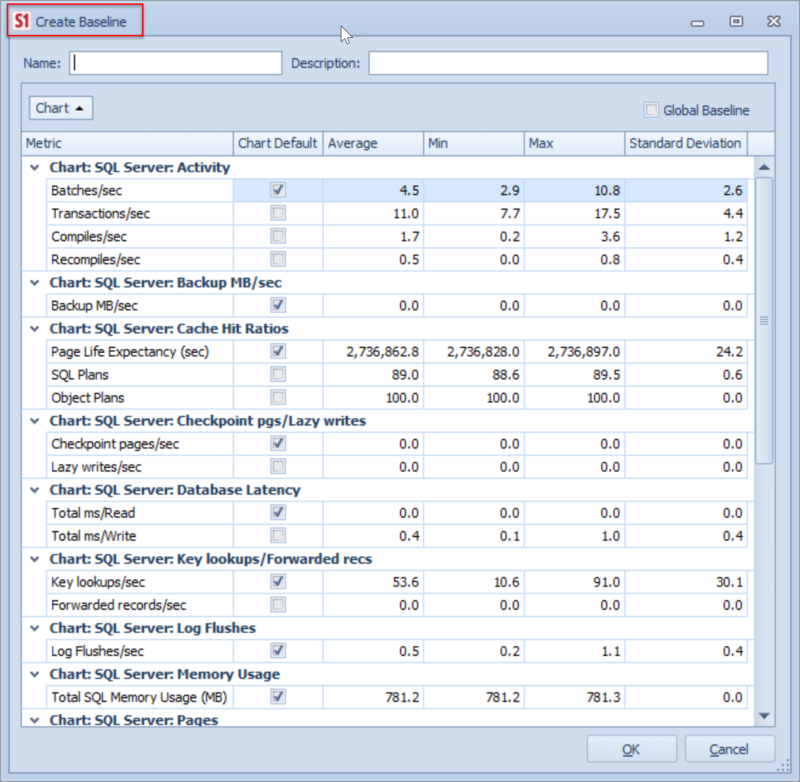 Baselines are created and managed from the History view of the Performance Analysis Dashboard. There are two distinct baseline types available. The first type of baseline is the predefined type. SentryOne includes several predefined baselines that are based on the historical metrics gathered in your monitored environment. The second type of baseline is the custom type. 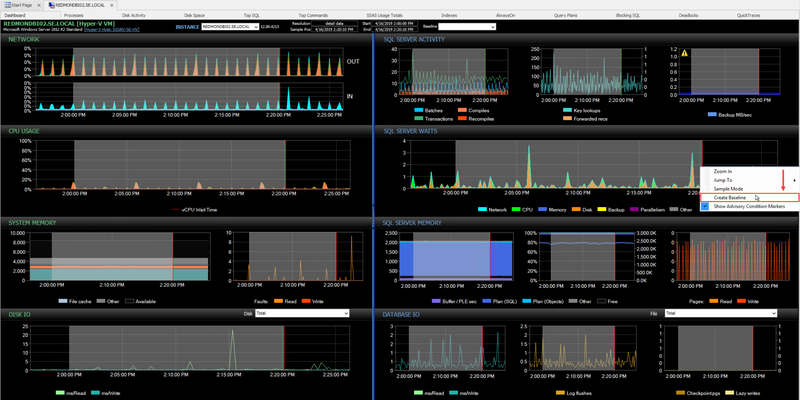 SentryOne also allows you to define your own custom baselines. Once a baseline has been selected, it's overlaid on the various Performance Analysis Dashboard charts, giving you information that can help you to manage change in your monitored environment. Custom baselines can also be used in Advisory Conditions, allowing the comparison of baseline values to current metrics, as they are captured. Note: At this time, you can't display a baseline created by one type of target overlaid on a different type of target. For example, creating a baseline against a SQL Server instance running on a Windows target can't be overlaid on an Azure SQL Database dashboard. Predefined baselines are available without any custom configuration. They can be accessed from the Baseline drop-down menu on the Dashboard while in History view. It's important to understand that predefined baselines are based on the historical data collected in your monitored environment. The granularity of the data-points that make up a baseline is entirely dependent on the time range you are viewing. By default, predefined baselines are shown with data-points that show the average value over that sample period. When viewing certain predefined baselines, and within a time range that has a resolution of detail data, an additional option is available, allowing you to view that baseline with a range of values (reference the Range Option Availability column in the previous chart). This range includes both a minimum and maximum observed value during the respective sample period. Custom baselines can be created on demand using the Dashboard user interface while in History view. To create a custom baseline, left-click on any Dashboard chart and drag to highlight your desired timeframe. Note: Create a custom baseline for a more specified time frame by adjusting the start and end time on the calendar toolbar to the time frame you'd like to baseline. Select Create Baseline from the context menu to display the Create Baseline form. Note: By default, a baseline is tied to the server and instance where it's created. Enable your Custom Baseline Globally by selecting the Global Baseline check-box. Metric The name of the metric captured in the baseline. Default Defines which metric in the chart is used when displaying the baseline. Note: This can be changed at any time. The value that's used for that metric in the baseline. This controls both the actual line displayed on the respective chart and the value used for comparison purposes in Advisory Conditions. Average is calculated based on the observed values for the metric within the baseline's time range. Note: To define custom values to be used with the baseline, simply edit the pre-calculated average value. Min The minimum value captured during the baseline's time range. Max The maximum value captured during the baseline's time range. Standard Deviation The standard deviation for the values captured during the baseline's time range. Note: You can change the Min, Max, Average, and Standard deviation values for any metric in the Create Baseline or Edit Baseline forms. Select the desired metric, change it to your desired value, and then select Ok to save your changes. The values defined for metrics that make up a custom baseline can be used in Advisory Conditions. To access a baseline in an Advisory Condition, define the Advisory Condition at that same instance level for which the baseline is defined. 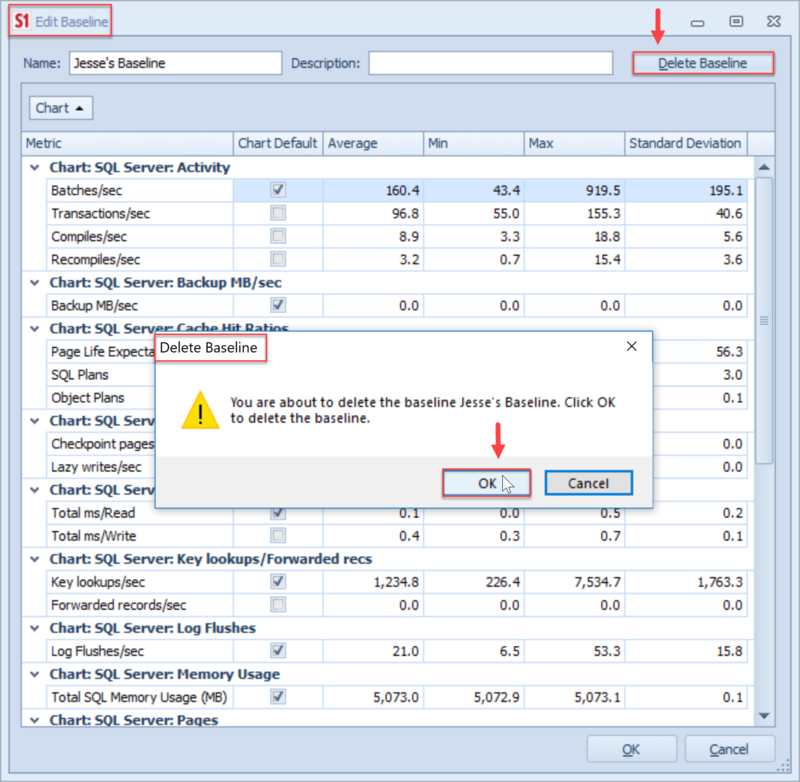 For example, if you create a baseline on the server named LONDON.UK.COM, to access the baseline in an Advisory Condition, create the Advisory Condition from the context of the LONDON.UK.COM server in the Navigator pane. For more information about Advisory Conditions, see the Advisory Conditions topic. or by selecting by the Baseline drop-down menu. Delete a baseline by selecting Delete Baseline from the Edit Baseline form, and then selecting Ok from the Delete Baseline window. When using baselines in Advisory Conditions, reference the following tables that include mapping between the metrics captured in baselines and their associated friendly performance counter names. Page Life Expectancy (sec) SQL Server Database Engine- Buffer Node - PLE : Equals : "Node Name"